Canada is the latest country to add the option of nation-wide SMS/text voting in the New7Wonders of Nature campaign. 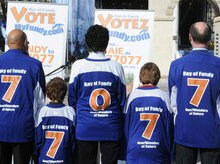 Terri McCulloch, Executive Director for Bay of Fundy Tourism, joined Nova Scotia Minister of Economic and Rural Development and Tourism, Percy Paris, and New Brunswick Tourism and Parks Minister Trevor Holder, as well as two young hockey players wearing special Vote Fundy hockey jerseys for a national press conference on February 17 to announce the initiative. SMS/text voting means that the 25 million+ Canadians who have access to SMS can vote more often for the Bay of Fundy as well as their other favourite finalists. All that voters have to do is text the word FUNDY (Eng) or BAIE (Fre) to 77077. Each SMS costs $0.25 and counts as one vote.